PAYROLLS: As ING writes, whereas forecasting payrolls growth is always more luck than science, there is even more guesswork than usual this month because there is a double hurricane effect to take into account. September’s payrolls figure of “just” 134,000 was clearly depressed by Hurricane Florence, which prevented thousands of workers in the Carolinas and Virginia from getting to work. This month there should be a clear rebound in the region with additional jobs created thanks to the rebuild/clean-up operations put in place. However, Hurricane Michael, which hit Florida and Georgia last month, will have had a detrimental impact on payrolls in that region through worker absence. As such, markets should refrain from placing much emphasis on the actual outturn. "For what it is worth," ING is "forecasting payrolls growth of 200,000, but to be honest, anything could happen – the range of economist forecasts is 105,000 up to 253,000, according to Bloomberg." 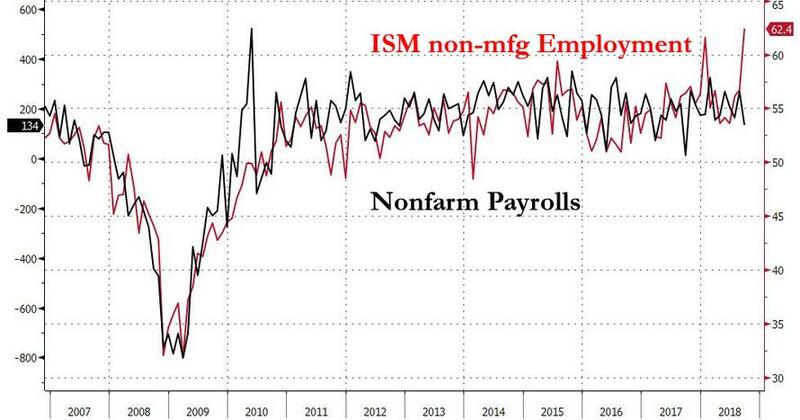 In this vein, a quick side note on the ISM non-mfg survey: if payrolls follow the employment component, tomorrow's jobs number should print in the 500,000 range, the highest since 1983. If that happens, look for 10Y yields to shoot into low earth orbit. WAGE GROWTH: When it comes to the one number that matters most, average hourly earnings, one bank is especially optimistic: according to ING, while pay rates have been grinding higher, the bank expects to see a real breakthrough this month. The annual rate of wage growth is set to push above 3% year-on-year for the first time since April 2009. ING, however, expects to see a 0.3% month-on-month, 3.2% YoY outcome. 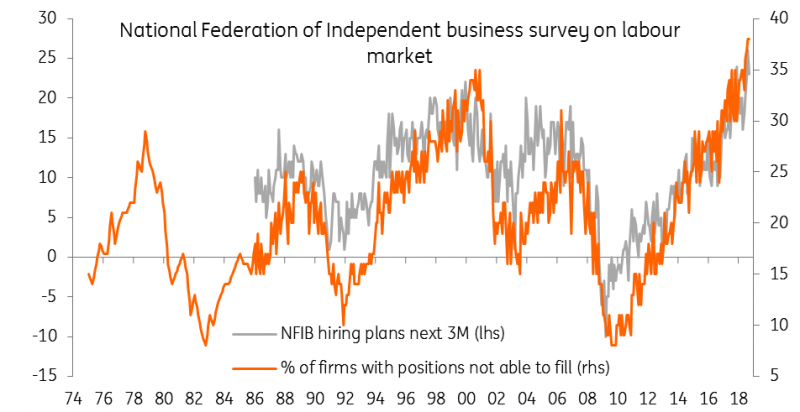 The NFIB survey below shows that the proportion of small businesses looking to raise pay is also at the highest in the survey’s long history, which shouldn't come as a surprise given the tightness in the job market. Goldman (Payrolls exp. 210K) is slightly less optimistic and estimates that average hourly earnings increased 0.1% month over month and 3.0% year over year, with calendar effects a negative this month, as the survey week ended on the 13th. As shown in the chart below, Hurricane Florence also appeared to temporarily boost average hourly earnings in the Carolinas, and the unwind of those effects could reduce October average hourly earnings growth by around 0.1%. 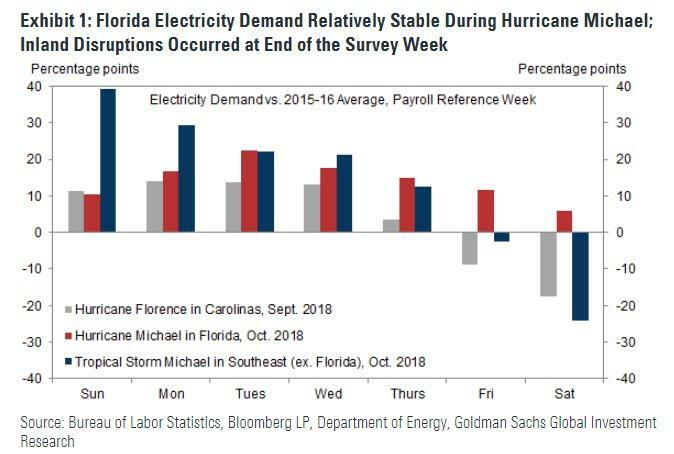 While Goldman cannot rule out an offsetting boost from Hurricane Michael in tomorrow’s report, the timing of those disruptions would argue for a limited impact. UNEMPLOYMENT RATE: The unemployment rate likely remained stable at 3.7% in October, after falling 0.17% in last month’s report (to 3.68% unrounded). Continuing claims continue to fall (-25k from survey week to survey week), and as shown below, the level of claims would argue against a rebound in the jobless rate. At the same time, the participation rate has returned to the bottom of its two-year range (62.7%), and a short-term bounce can not be ruled out. WEATHER IMPACT: As noted above, for the second month in a row, a key focus in tomorrow's report will be the impact of recent hurricanes, and specifically how they affected payroll growth. 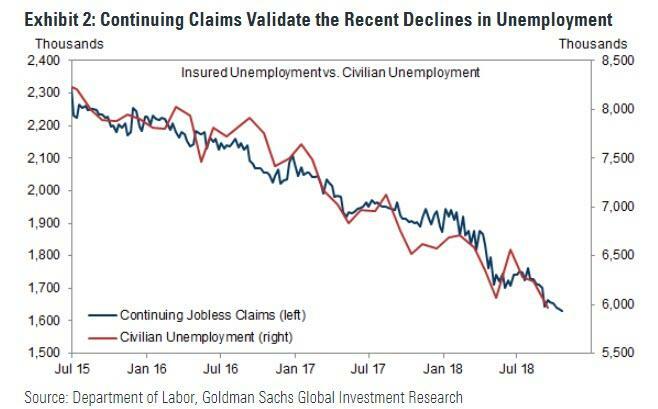 Barclays analysts say that in contrast to September, US initial jobless claims data is continuing to show only a modest effect from Hurricanes. In the week-ending 13 October (which captures the October data survey period), initial jobless claims fell by 5k in the week to 210k, and the four-week moving average rose only slightly to 212k from 210k. "At the state level, the very modest rise in initial claims following the hurricane that made landfall in North and South Carolina in early September appears to be reverting," Barclays says, pointing out that initial jobless claims in North Carolina rose by around 10k initially, but was now tracking lower, while South Carolina's rise was much more modest and has now reverted. "The relatively mild rise in initial jobless claims following the hurricane in these two states seems at odds with the notable softening in nonfarm payrolls in September," and adds that while it believes the storm did temporarily weaken some categories of employment, it has a tough time reconciling the stability of the initial jobless claims data and the slowing of September payroll growth, and expects revisions when the report is released on Friday, adding that “for now, the signal from the claims data remains one of low rates of job separation and, in turn, healthy labor market conditions." TRADE WARS: There will be attention on the manufacturing jobs component of the report to assess how much of an impact trade wars is having on US manufacturers' hiring. "We expect soft manufacturing and construction payrolls, factory payrolls have been slowing since the first tranche of tariffs in July," UBS notes, adding "we expect to see factory employment slowing much more sharply in October after the 10% China tariffs were put in place." ADP PAYROLLS: ADP's gauge of payroll growth in October beat to the upside, printing 227k job gains in the month against a consensus 187k; "whether it tell us anything about Friday's official number is another matter altogether, because ADP won't capture any hit from Hurricane Michael, but the official data will," Pantheon Macroeconomics said. "ADP counts names on payrolls, while the official data only include people who were paid - anything - during the survey period," the consultancy explains, "this means that part-timers, in particular, can drop off the official payroll count when bad weather prevented them from working during the survey week." Pantheon says it would be very surprised to see Friday's headlines as strong as the ADP data, "but with hurricanes making landfall in the survey weeks in both September and August - that has never happened before, as far as we know - we're braced for anything," it says. LAY-OFFS: Challenger reported that October job cut announcements rose to 75.6k, largely on Verizon's announcement that it will offer voluntary severance packages to 44k managers in an effort to trim costs. "The good news for those accepting offers is now is a good time to look for a new job, especially if they act quickly," data compiler Challenger said. "The increase in job cut announcements could indeed indicate we're heading toward a downturn, although employers are still holding on to their workers for the most part." Challenger also noted in its report that the economy is at near full employment, and job creation has typically surpassed expectations. Wages remain flat, however. Meanwhile, recent fluctuations in the stock market indicate investor concerns and that tariffs are beginning to have an impact." FED REACTION: The US economy continues to grow strongly and with the job market continuing to tighten, there is growing evidence of pipeline pay pressures. Inflation is already above the Federal Reserve’s 2% target on all the key measures the central bank follows and rising wage growth will only add upside risks for inflation. As such, the Fed looks set to remain in tightening mode with a December rate hike looking virtually guaranteed followed by three more 25 basis point interest rate rises next year. Rebound from Hurricane Florence. State-level data for September showed a 36k drop in North and South Carolina payrolls (mom sa), consistent with a drag from Hurricane Florence of around 50k (assuming trend growth of 15k in those states). 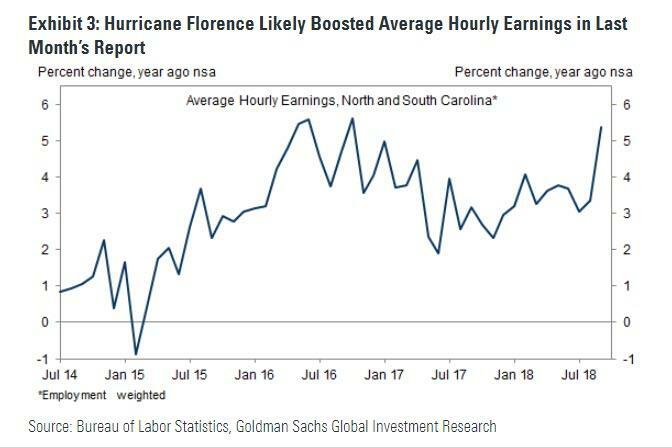 While most of these workers had likely returned to work by early October, Goldman expects the weather-related boost in tomorrow’s report to be partially offset by the negative impact of Hurricane Michael. While particularly strong (category 4), the most severe effects of Hurricane Michael appeared to be concentrated in a smaller swath of the country (mainly the Florida panhandle and parts of Georgia). Over 350k people were ordered to evacuate ahead of Hurricane Michael, compared with 1 million people for Hurricane Florence (we estimate the payroll impact for that storm at -50k) and 6.5 million Floridians during Irma (estimated payroll impact of around -180k). Power outages in Florida also appeared to affect a smaller share of the state (see red bars in Exhibit 1). Jobless claims. Initial jobless claims remained just above cycle lows during the four weeks between the payroll reference periods (averaging 212k). Continuing claims also moved lower, falling 25k between the survey weeks. ADP. The payroll-processing firm ADP reported a 227k increase in October private payroll employment—40k above consensus and the fastest pace since February. We view the report as evidence that the pace of job growth likely remains well above potential. Job availability. The Conference Board labor market differential—the difference between the percent of respondents saying jobs are plentiful and those saying jobs are hard to get—rose 2.7pt to +32.7 in October, a new cycle high. JOLTS job openings also rose to a new cycle high in the most recent report (7,136k in August). Company-level one-offs. We expect a few company-level developments to weigh on service-sector job growth in tomorrow’s report, with a combined payroll impact of around -10k to -20k. Within the retail industry, we expect a drag from bankruptcies of Steinhoff Mattresses (closing 200 stores immediately) and Sears (closing 46 stores by November). A voluntary layoff program at Verizon (44k employees eligible) is likely to weigh on information payrolls, but we expect most of these individuals remained employed during the October survey period. Finally, a hotel workers strike will reduce October job growth by 2k. Service-sector surveys. Service-sector business surveys softened on net in October, with our non-manufacturing employment tracker pulling back from a cycle high (-1.0pt to 56.6) and our headline aggregate falling by 2.7pt. Those declines may overstate the underlying trend however, as we believe the particularly weak Richmond Fed measure was impacted by the hurricanes. Service-sector job growth rose 75k in September and averaged 145k over the last six months. Tariff uncertainty. Trade tensions escalated further in the weeks leading up to the October reference period, as the White House imposed a 10% tariff on $200bn worth of Chinese imports on September 24th. We continue to expect that the growth and employment effects of trade frictions will be modest in the US, and accordingly, we are not embedding an explicit drag from the September tariffs in our payroll estimates for tomorrow. That being said, we note the risk that increased uncertainty or the prospect of retaliatory tariffs may have weighed on hiring. Manufacturing surveys. Manufacturing-sector surveys were generally weaker in October, but most remain at elevated levels. Our manufacturing employment tracker fell for the fourth month in a row (-0.5pt to 57.3). Both the headline aggregate and employment subcomponent of the ISM manufacturing survey declined by more than expected in October. Job cuts. Announced layoffs reported by Challenger, Gray & Christmas increased by 26k in October to 78k (SA by GS). On a year-over-year basis, announced job cuts rose 48k. However, these increases reflected the voluntary layoff programs in the telecom sector (discussed previously), and job cuts actually declined across the remainder of industries (+19k mom).